Oftentimes, as we get older, our lifestyles tend to become more sedentary and our stamina begins to decrease. To overcome the decline in our endurance levels, it is important to incorporate activities that will safely raise your heart rate to an active level. Walking during sunrises or sunsets, water aerobics and playing games outdoors with grandchildren can help increase blood flow throughout the body as well as raise endorphin levels, burn calories, improve overall energy levels and more. Learn more about how to safely and properly perform these exercises here. While improving your flexibility may not directly increase your performance in endurance or strength-based exercises, it will enhance your mobility and ability to reduce joint and muscle pain. Daily stretching can help condition muscle fibers to strengthen, allowing your body to feel more relaxed and rejuvenated with each routine stretching session. For best results in enhancing your mobility, set a goal of stretching early in the morning right after waking up and then again before you retire to your bed for the evening. 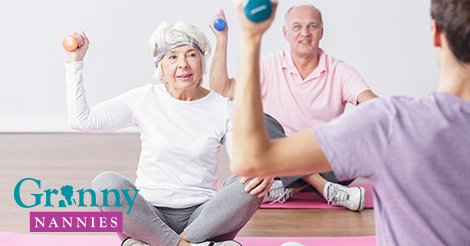 In combination with endurance and strength exercises, flexibility exercises can help you achieve your activity goals and keep your body in top condition as you age. If you or a loved one needs assistance in completing basic exercise or range of motion exercises, the Certified Nursing Assistants (CNAs) and Home Health Aides (HHAs) referred by Granny NANNIES are trained to provide the special care required and can do so in the privacy and comfort of home. Alongside therapy and other preventative actions, CNAs and HHAs assist in routine, daily activities, personal care and monitoring of cognitive risk factors. Granny NANNIES was established in 1990 to provide seniors with available in home care. Operating under the founding premise that reliable and affordable senior home care should be available to everyone, Granny NANNIES offers personalized services to meet the requirements of any individual, regardless of age or need, in their home. Available 24 hours a day, 7 days a week, we provide quality and trustworthy in-home care for you and your loved ones. For more information on how we can help you, call 800-316-2669.